Since I don't have the coins to go out and buy the things I want, I went "imaginary" online shopping today! Here are a few of the items I have been OBSESSING over lately!! This dress caught my eye because of its "washed" look! I love how it simulates old faded jeans but the dress is actually silk! The embroidery is what makes me fall in love with this dress! Its so simple yet the fit gives off sexiness without showing too much! This dress is gorgeous!! It resembles the black latex leggings that everyone has worn one way or another and those puffy sleeves are to die for! I guess I am truly in love with pieces that exude the word Oxymoron. This dress resembles an evening dress yet the "sweatshirt" material makes it a more everyday piece. Depending on how you pair this dress up, it can become a staple in your wardrobe. This skirt channels my inner Kelly Kapowski from "Saved by the bell". Kelly Kapowski's style looks better and better to me nowadays LOL. What girl doesn't want a leather skirt? 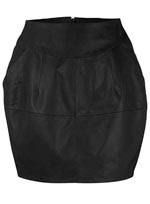 This mini leather skirt is a perfect staple piece with a great shape. Well need I say more?! 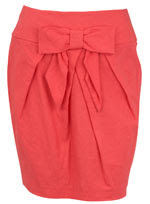 This skirt has pockets and a huge bow in the front! Heaven on Earth! I have been wanting this dress every since it debuted on Evans website! 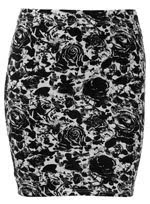 It's such a statement piece which would be perfect paired with a leather jacket for a more edgier look! These shoes are 6inches are pure awesomery!! I love the style and color of this shoe. The bright color and sky high platform heel is only added greatness! I haven't had much money for shopping lately either. I'm tempted to go one further and photoshop myself wearing all the Evans clothes I want, lol! @Bethamint LMAO!! That's a good idea!! It's getting to be that bad, I may have to do the same! I need to come up on a Job ASAP!! I feel the same way! I've been drooling over this dress : http://www.dorothyperkins.com/webapp/wcs/stores/servlet/ProductDisplay?beginIndex=0&viewAllFlag=&catalogId=20552&storeId=12552&categoryId=134453&parent_category_rn=49448&productId=1335317&langId=-1 for quite some time now. Cute but simple. @CurvyDiva Girl I love that dress!! 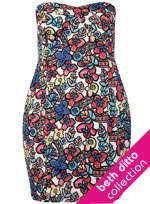 I have one from torrid that's black and white but the pink makes me want this one too! Have you ever ordered from DP? If so what size do you get? I'm a size 20 (U.S) but i've never ordered from the site before. I wonder if i can fit their clothes because they are sooo cute! Love love love those Dorothy Perkins everything you picked from Dorothy Perkins! I have never shopped from there but they have such fab clothes! @Brittany I've never ordered from DP before, though I'm severely tempted. I'm a US 22, so I dont think they'd have anything to fit me. I can fit some US 20's, so it depends. But you should check it out! and go for it! Their stuff is way too cute! @CurvyDiva Thanks for getting back to be girl! I think I may order something like a stretch dress or a shirt when I get some money just to see how things run. I ordered from ASOS and I got a size UK 20 in shirts and they were both too big for my liking so we may be in luck! Hey sweety! 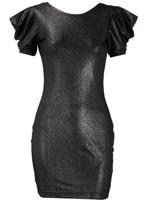 I have the Dorothy Perkins grey dress, and an other one in the same style by Evan's, I just LOVE them!!! @Les Pitreries de Vanoue! DOn't you just love that dress!! Do you Know what size you are in the U.S? Also what size did you get in the dress if you don't mind me asking? I'm kind of timid to purchase from UK retailers because of sizing! I have that grey bodycon dress and will actually be wearing it tonite. Lovely dress. I have become quite addicted to the Store. Hello Brittany I wear a US 16 and an UK 18/20 for dresses (I usually take 20 at DP)! @Les Pireries de Vanoue hmmm Idk. I wear a US 20 so i doubt those UK sizes from DP will work for me. Maybe the tops and some dress, but i'm not sure. Thanks for the info though. I really think the size 22 will suit you because they have many stretchy clothes.